Bitcoin is an early example of this so predicted future scenario. This article provides our readers with understanding and functioning of bitcoins, in a detailed yet precise manner. To understand bitcoins, let’s disintegrate the term “Bitcoin”. There are two words, “bit” and “coin”. “Bit” refers to a basic unit of information in computing and digital communications. I hope I don’t need to explain the word “coin”. Now, fusing these two words together, “bitcoin” could simply mean a digital or a virtual currency. Specifically, bitcoin is a virtual currency that is created from computer code. Who created it, is still clouded. Just like other currencies, bitcoins can be exchanged for goods and services or for other currencies, provided the other party is willing to accept them. Yet many features differentiates bitcoin from conventional physical currencies like dollar or rupee. How does Bitcoin differ from physical currencies? Bitcoin is a decentralized currency managed by peer-to-peer (P2P) technology. What is meant by P2P network, is that, what you are thinking? No worries!! In a P2P network, a group of computers is connected to enable the sharing of resources and information by users, and there is no central location for the network. This is diametrically opposed to a typical client-server network, where the central server controls the level of access by users to shared network resources. Popular applications of the P2P concept are Skype and file-sharing services such as BitTorrent. All the functions starting from issue of bitcoins to transaction processing and verification are carried out collectively by the network, without a central agency to oversee operations. In contrast, a physical currency is issued by a central bank as part of its mandate to manage national monetary policy. Bitcoin is primarily digital. Conversely, existing currencies exist primarily in physical form. The bank balances can be converted into physical units within minutes if you so desire. Yes. The total number of Bitcoins that will be issued is capped at 21 million. However existing currencies can be issued without limit. Bitcoin is a complex product. A fair degree of technological knowledge is required to understand the concepts of cryptocurrencies. Bitcoin balances are not insured. This means that if you lose your Bitcoins for any reason, you have little recourse. Currency balances held at banks, on the other hand, are insured against certain events. Bitcoin has limited acceptance as opposed to physical currencies and cannot be used at many brick and mortar storefronts, although that may eventually change if it continues to gain traction. All these differences become self-explanatory once we understand how the entire system of bitcoins work. Several exchanges and platforms have emerged to allow people to buy or sell bitcoins using different currencies. Similar to sending cash digitally, people can send bitcoins to each other using mobile apps or their computers. This term is one of the key terms of bitcoin habitat. To understand it, first we need to know about yet another relevant term “blockchain”. Blockchain is the Bitcoin’s public ledger or log of executed transactions. Mining is the process of adding transaction records to blockchain. But this is not so easy. The process of validating transactions and committing them to the blockchain involves solving a series of specialized math problems. Each Bitcoin “miner” is competing with all the other miners on the network to be the first one to correctly assemble the outstanding transactions into a block by solving those specialized math problems. In exchange for validating the transactions and solving these problems, Bitcoin miners are rewarded for all of the transactions they process. This block reward is also the process by which new bitcoins are created. Money is usually kept in wallet or bank. Unlike physical currencies, bitcoins themselves are not tangible things which need storage. It is more like a bank balance – just a number. When coins are mined, the miner’s balance is credited via a reward which adds to his or her available balance. When coins are sent from person A to person B, that transaction subtracts from A’s balance and adds to B’s balance. But how this balance is ascertained? This information is split. Some information is stored on your PC in the wallet.dat file. Some information is stored in the block chain. Wallet.dat file, as the name suggests, is the digital wallet file for your key pairs that let you use your coins. Here we would like to take a discourse from the topic and discuss key pairs, for those not familiar with cryptography. A key pair consists of a “public key” and a “private key” which can be used to encrypt or sign bits of data. The public key, as the name suggests, is known to everyone and can be used to encrypt messages in such a way that the holder of the private key alone may decrypt them. The private key may also be used to sign messages in such a way that anyone holding the public key may verify that the message truly came from you. Analogous to this, bitcoin balances are kept using public and private keys. The public key, comparable to a bank account number, serves as the address which is published to the world and to which others may send bitcoins. The private key, comparable to an ATM PIN, is meant to be a guarded secret, and only used to authorize Bitcoin transmissions. The private key resides in the wallet.dat file. If you lose those, you will lose access to your money. Apart from it, the block chain contains the relevant information. When you initiate a transaction, all previous transactions to or from that address are scanned and a balance is calculated. If your transaction exceeds this available balance, it will be rejected by the network and will not be included in a block. Once you have acquired bitcoins, you can use them for an online transaction with a company that accepts Bitcoins as a payment mode. The company will send you the Bitcoin address to which you can send your Bitcoin payment. The payment is directed to that address. While the transaction takes place within seconds, verification can take 10 minutes or longer. This is the picture for bitcoin users. Behind this, lies is a technical design that ensures transparency and visibility. To reiterate, the system is peer-to-peer (P2P), transferring value directly over the Internet through a decentralized network without an intermediary. The system relies on cryptography as discussed above, whereby, transactions are validated and recorded in the blockchain. 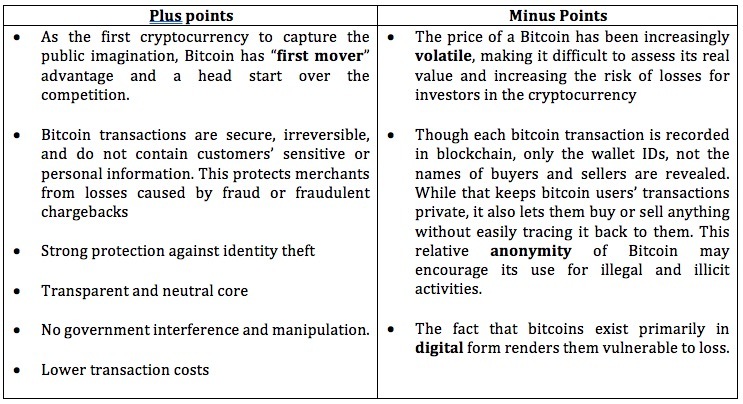 In order to process a bitcoin-denominated transaction, the two things are verified. The first is that when user A transfers a bitcoin to user B, user A has a bitcoin to spend that is, prevention of counterfeiting. The second is that when user A transfers a bitcoin to user B, user A is not trying to transfer the same bitcoin to another user, user C simultaneously that is, prevention of double spending. To understand it better, let us consider an example. ABC creates a new Bitcoin address and directs to PQ to send payment to it. When ABC creates a new address, what he really doing is generating a key pair, composed of a private key (known only to ABC) and a public key (available to PQ and anyone else). The public key allows anyone to verify that the message signed by the private key is valid. PQ tells her bitcoin client (the free Bitcoin software first installed on PQ computer or mobile device) that she would like to transfer the purchase amount to ABC’s address. PQ’s wallet file holds the private key for each of her bitcoin address. Bitcoin client will electronically “sign” the transaction request with the private key of the address from where PQ is transferring the Bitcoins. Recall that PQ’ public key is available to anyone on the network to verify that the transaction request comes from a legitimate account holder. This transaction is broadcast to the network and will be verified in a few minutes. 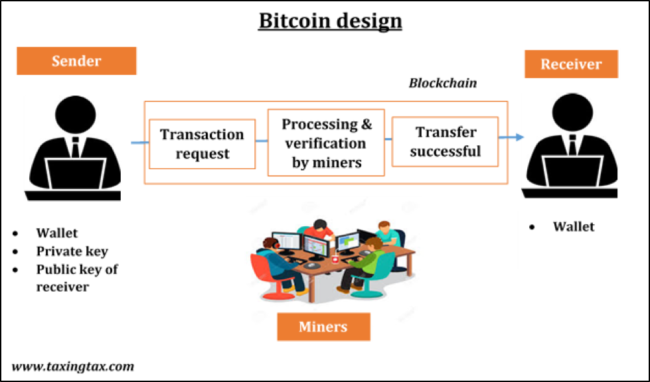 The transaction request floats in the network until miners in the network pick it up for processing. The miners verify that the PQ has enough bitcoins to make the payment. Each Bitcoin “miner” then competes with all the other miners on the network to be the first one to correctly assemble the outstanding transactions into a block by solving those specialized math problems. The 5 Bitcoins are successfully transferred from PQ’s address to the ABC address. I hope there is much clarity on working of bitcoins now. But remember, bitcoins are beyond currency. Bitcoin has emerged to a nearly frictionless global payment system and why so and how it differs from existing payment systems, is our next topic for discussion. How does bitcoin as a payment system differ from existing payment systems? Once again reiterating, Bitcoin is a decentralized currency managed by peer-to-peer technology, without an intermediary. Bitcoin does not require an intermediary to validate transactions, thereby reducing friction in payments. Whereas the current payment systems, like credit cards and PayPal, require third party intermediaries that often charge high processing fees, even for micropayments. Traditional payment systems rely on the privacy of transaction information to maintain security whereas Bitcoin relies on cryptography. As every transaction is validated with cryptography by the network of miners, Bitcoin functions because of its openness, not despite it. Bitcoin uses its own product, bitcoins, to reward or “pay” miners who are providing the computing power that serves as the engine of the transaction verification system. As a result, the system does not require the same type of overhead that traditional payment systems might require. In this sense, Bitcoin functions because of those participating in the system. The next section deals with Bitcoins in Indian context. India is no exception to bitcoins expanding popularity. Have a look. In India, Bitcoin is still in its nascent stage and does not have regulatory clarity. Trading platforms or exchanges exist to provide for bitcoin transactions, which inter alia includes Unocoin, Coinsecure and Zebpay. Of late, Government of India is seeking expert advice for deciding the viability of the bitcoin. The primary question before the government is whether these virtual currencies should be banned, regulated or observed. Amidst all this, another concern which is troubling Bitcoin investors is the taxation aspects of bitcoin transactions. Though bitcoins remain unregulated and not tainted illegal, profit arising on sale of bitcoins by itself, is an income to be properly “headed” and taxed. Depending on each case, the preference could be taxing income under “Business Income”, “Income from capital gains” or much safer option “Income from other sources”. Please note that the Central Board of Direct Taxes (CBDT) has not yet issued any guidance in this respect. Bitcoin is an innovation in the area of digital currency and its myriad potential, purposes and applications are yet to be decided. Many factors will influence Bitcoin’s evolution, including regulation, technological innovation, and economic conditions. In order to achieve wider adoption as a currency, Bitcoin needs to address significant questions around volatility, regulatory uncertainty, exchange security, ease of use, and transaction volume. Bitcoin’s direct relevance to traditional government domains, such as currency and taxes, merits specific consideration.